How are we all today, keeping well and warm I hope? My make today is a canvas that I made for Jenny at the end of last year for Create and Craft, however jenny forgot to take it with her, bless her she has so much to remember to take…. I know the feeling!! I really enjoyed getting inky and messy creating this, it made me feel like a child again when my mum used to let me loose with paints!!! So let’s take a look……. I used acrylic paints on the canvas background……. A closer look at the detail……. 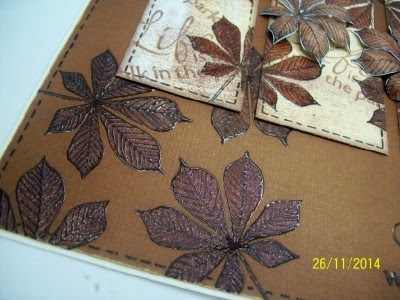 I combined Distress inks on the leaves to get a real autumnal look and added a touch of embossing powder…. Well I do hope you like my make today and hope that it has given you some inspiration….. This entry was posted in News and tagged acrylic paint, Altered Canvas, Falling Leaves, Hobby Art, Lisa B Designs, Lisa Baker, Sunny Day Greetings on 28/01/2015 by Lisa Baker. This entry was posted in Gallery on 27/01/2015 by Becki. Bad Girl Bernie I missed a blog post on the 12th Jan so sorry peeps but in my defence I have been unwell …I wont bore you with all the details but to make up for it I have not one …not two but three projects to share with you . The first is using a rubber silhouette stamp which is of an oriental poppy. You will need 4 circles of card 2 white and two red the 2 white cards need to be cut at 4 inches and 4 1/2 inches the red need to be cut at 4 1/4 inches and 4 3/4 inches so when you layer them up you will have a graduating circle …. The next project I would like to share is a tag well two tags using the same stamp but two very different looks …The first is clean and simple a white tag using the Silhouette Grasses which is a grey rubber stamp. How I did this is I inked in Antique Linen distress inks and then taking distress markers using the brush end tap the marker over the already inked stamp I used a selection of different greens for the stem’s of the grasses and then tapped lightly over the tops of the flowers in Peacock Feathers stamped and heated with a heat tool to set and popped a Happy Birthday sentiment on the side . This entry was posted in News on 26/01/2015 by Bernie Simmons. Heidi here to share another project with you today. I have made a little frame using the gorgeously versatile set ‘Butterflies’, along with some turquoise card pieces and a wonderful die set ‘Hexagon Stax’ from Die-Namics. Firstly, I started by die-cutting all of the elements out. I have stamped the small butterfly all over the frame with Versafine ‘Vintage Sepia’ ink and cut out the butterflies and attached with strong glue. Onto white card, I have stamped the sentiment in the set and edged with ink. Then sticking all of the elements together using sticky pads to raise the frame elements. Lastly, adding some pearls to the butterflies and frame corners. This entry was posted in News on 22/01/2015 by Heidi Green. 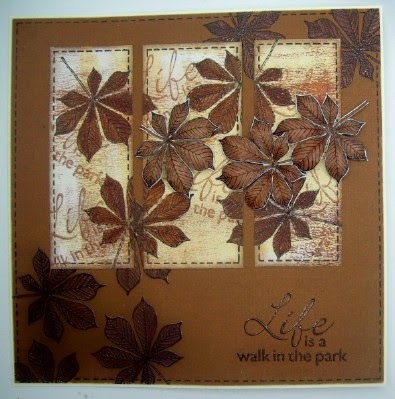 It’s my turn to post something on the Hobby Art blog, so I chose a card that I made with one of Jenny’s wonderful new stamps CS086D Falling Leaves. It is always exciting when I get a parcel with the new designs in. I love leaves so this has become a firm favourite as soon as I saw it. So many ideas, so little time, mores the pity. 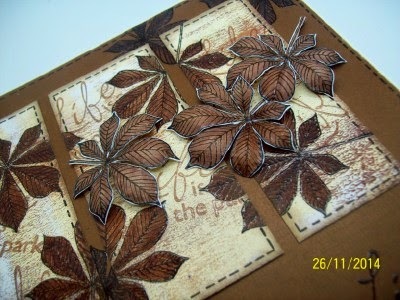 I stamped and embossed the Horse Chestnut leaf randomly onto a piece of handmade background paper. If I remember rightly it was a piece of copy paper that I had cleaned my brayer on after using actylic paint on my Gelli Plate. I told you I never seem to throw anything away lol. I masked the leaves and then stamped randomly over the panel with another of the new stamps CS087D Sunny Day Greetings. 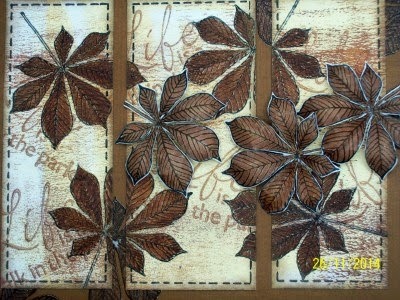 I coloured the leaves in using a Brown Wink of Stella brush and then trimmed the panel and cut it into three. I also fussy cut out several other leaves which I added to the card using silicon having first shaped them on a padded mat. The main card has also been stamped, embossed and coloured with more of the leaves and then I added some faux stitching around the edge. Why not check out the Gallery where there are loads of fabulous samples to inspire you. Have a great weekend. Happy Crafting. This entry was posted in News on 17/01/2015 by Kim Reygate. It’s all go here. While Peter is off snowboarding in Bulgaria Becki and I are running around in circles getting everything ready for the Create and Craft shows at the end of the month. Having said that we are both managing to find time to make lots of cards with the new stamps. The stamps are lovely and addictive! Sharon Bennett has worked her magic again. The date of the Create and Craft shows was originally the 29th January – so some of you may need to change the calendar! The shows are now 7pm on Tuesday 27th January and 8am on Wednesday 28th. As usual there will be 2 new sets plus 2 foam mounted stamps. We’re thinking ‘spring’ now although, with the snow arriving in different parts of the country, maybe I’m being a bit optimistic. All the Design Team are hard at work (we call it work) making lots of samples and some are already arriving…… you won’t be disappointed. We’re also launching a ‘Hobby Art monthly special’ on the 1st February so I’m flitting from one project to another at the moment. If only the cards I made in my dreams counted! You’re going to love the Monthly Specials. Each month there will be a NEW clear set, or rubber stamps, 10% off the usual price, with a free project sheet. There will also be extra offers, on the website, to go with the new set. The information will be on the website at the end of January but dispatch won’t start until 1st February. I’m sooo excited. Anyway back to work….. I’m just off to pack the goodie boxes for the 1st Workshop of the year on 31st January. Then more cardmaking I think……It’s such a hard life. This entry was posted in News on 14/01/2015 by Jenny Mayes. Hi Everyone!!! I hope that you all had a lovely Christmas and I hope that you all have a wonderful new year, late I know but this is my very first blog post of the year. For my first blog post and my first non Christmas card for quite a while, I had to use this beautiful Open Flower stamp. What I did is stamped them onto craft card and then coloured the flowers in with my clear Wink of stella (that is in the winter sale at a amazing price!) by picking up some red from my red wink of stella to give it a more subtle colour. I have then used a sentiment from the very lovely Friend set to go with the flowers. This entry was posted in News on 09/01/2015 by Laura Wiliiams. The challenge for January is ‘Bright & Happy’ because at the beginning of the new year there is so much to look forward to with the year ahead. And Happiness really can mean so many different things to each of us. or post onto Facebook or Twitter and say it’s for the January Blog Challenge. that will be launched at the end of the month on Create & Craft. 8. When emailing entries please include your name. This entry was posted in Blog Challenge, News on 09/01/2015 by Becki. Do you ever make a card for a friend just because….I was asked to participate in a R.A.K . For those who don’t know what this is it stands for Random Act Of Kindness. A lovely lady I chat to on Facebook and I have also had the pleasure of meeting is Doreen Sympson. So on my travels one day a spied a small card easel which I thought would be a good little thing to send light useful and small enough to pop into a Padded envelope ….. Ideal so now needed a card to go with it. I decided to make a bright and cheery easel card to match it! I chose the Sunflower set to help banish the winter blues. And a sentiment from the Sunny day Greetings the other sentiment on the topper is from Friends Sentiments ….Small Butterflies are from the Butterfly set. Stamped then with Versafine onyx black the quickly heat embossed in clear embossing powder. ….This allows me to use pro-markers to colour the images without the ink bleeding….the colours used for the sunflowers were lemon, summer sun , and sunflower,and the greens are Apple Cider. Pear Green and Lime Twist.the Blue is Tumbled Glass distress ink with my home made cloud mask ( I cover how to make this in a previous post) and the green ink was Bundled Sage Distress ink which you can buy from Hobby Art the black line at the back of the sunflowers is draw in with a Black pro-marker using a fine nib….Well I hope you enjoy looking at this card and much as I enjoyed making it for Doreen …..go on you don’t need a reason to tell someone you are thinking of them make one …..Just because. This entry was posted in News on 07/01/2015 by Bernie Simmons. Blog Challenge – December Winner! A BIG Thank you to everyone who entered Hobby Art’s December blog Challenge. The entries are really gorgeous and we can see so much time and effort has gone into everyone. I’m so glad we use a random number generator because choosing between them would be so difficult. We will be contacting the winner. You can see all the entries below. To all entrants Thank you for all your hard work! We will put a sample card, or two, onto the blog during the next day, or two, to give you some inspiration. Hope you find time to ‘have a go’. This Gorgeous Card was made by Christine Smith. These Gorgeous Card were made by Doreen Sympson. This Gorgeous Card was made by Gemma Saunders. This Gorgeous Card was made by Hellen Pearce. These Gorgeous Cards were made by Helen Powell. This Gorgeous Card was made by Janet Bloomfield. These Gorgeous Cards were made by Janine Quinn. This Gorgeous Scrapbook Page was made by Julie Wilson. These Gorgeous Cards were made by Karen Paine. These Gorgeous Cards were made by Kate Discombe. This Gorgeous Door Plaque was made by Maxine Fryer. These Gorgeous Cards were made by Moira Walters. These Gorgeous Cards were made by Shirley Bowness. This Gorgeous Card was made by Theresa Pace. This Gorgeous Tin Project was made by Viola Crossley. 2nd Prize of 2 Clear sets (or 4 foam mounted stamps) so that everyone stands a chance of winning. This Gorgeous Project was made by Linda Walker. This Gorgeous Card was made by Tracy Southam. This entry was posted in Blog Challenge, News on 01/01/2015 by Becki.